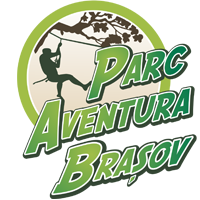 PARC AVENTURA BRASOV is also opened during rainy days. dispune de 15 trasee de dificultate progresiva. No individual payment possible. The bus-driver or tour guide has to purchase all tickets for the group. A tour agency address is required. How much time can we spend in Parc Aventura? The borrowed equipment is for 3 consecutive hours. Once equipped, you have to stay in the park. The equipment refund is definitive. During the 3 hours you can cross different routes (more or less difficult). Routes’ duration is between 15 min. and 1 hour, according to the difficulty range, the number of the other participants and your agility. If you want to stay over the 3 hours, you can pay an extra hour. Is Parc Aventura opened during the rainy days? Yes, the park is opened during the rainy days. For security reasons it will be partially or completely closed during the storms (lightening and bolt), wind or heavy rain. When is Parc Aventura opened? During the summer season, Parc Aventura is opened every day, 7/7, from 10:00 to 19:00. During the winter season, the program is made accordingly to the sunset. "This park is a MUST DO if you are in Brașov. Everything begins with an explanation of the park and the courses and how to use the gear you are given. If you arrive late you have to wait because the number of gears they have is limited. There is a weight restriction if i remember correctly so you might want to check that out to be sure. The best part is that you can feel like Tarzan in the jungle. The obstacle courses will give you a good workout and something to think about because most can be resolved by your body pretty easy if your brain can see the trick behind them. The courses are separated by colors. From yellow, blue, green (can't really remember the right order) to red and black being the hardest. It is a fun experience but it is a pretty tiring one so be ready to laugh and sweat and even call help when it is to hard or you get stuck. The attendees are wonderful and they will explain to you some of the tricks behind the courses." For your own security we kindly ask you to read and respect these rules of participation before you start. Reading and complying with these rules may reduce (but not eliminate) the risk that you will have a serious accident. Vrei să te inițiezi în sporturile de iarnă sau ești cunoscător și vrei să treci la următorul nivel? Te așteptăm la cursurile școlii noastre de ski si snowboard! Rezervă acum lecția ta de ski!